Homemade barbecue sauce without all the preservatives of the store bought brand. Easy to adapt to your preference. Make it mild or spicy. Ready in just an hour. My husband has mad BBQ skills. In fact, his genius at barbecuing is one of the top three reasons I married him. Following closely behind: his “willingness” to let me be the family’s permanent DJ. After years of using store bought BBQ sauce, I realized I needed to step up my game and make a Easy homemade barbecue sauce without all the preservatives of the store bought brand. Easy to adapt to your preference. that rivals the tenderness and deliciousness of the meat he grills. Plus, it’s cheap and easy to make. I usually make a double batch, measure out one cup servings into freezer sandwich bags, lay them flat in the freezer to freeze and then pull out what I need. Easy Peasy. 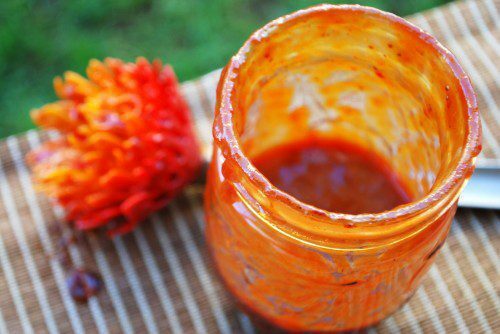 Once you taste this homemade sauce, you’ll never buy it from the store again. We do solemnly promise. Easy homemade barbecue sauce without all the preservatives of the store bought brand. Easy to adapt to your preference. In a large pot, combine all ingredients together. Bring to a boil and reduce heat to low and simmer for 1 hour. For thicker sauce, simmer longer.